According to the Native American Indians, before a person can be healed or heal another, one must be cleansed of any bad feelings, negative thoughts, bad spirits or negative energy - cleansed both physically and spiritually. This helps the healing come through in a clear way, without being distorted or sidetracked by negative 'stuff' in either the healer or the patient. The elders say that all ceremonies, tribal or private, must be entered into with a good heart so that we can pray, sing and walk in a sacred manner, and be helped by the spirits to enter the sacred realm. Also, the space in which the healing or ritual occurs must first receive a clearing or cleansing of any prior negative, stuck, or old energies that could interfere with bringing in the sacred or fresh new energies. The act of burning sacred herbs and using the smoke with conscious intention to cleanse a person's aura or body as well as clearing a space with the smoke is known as smudging. 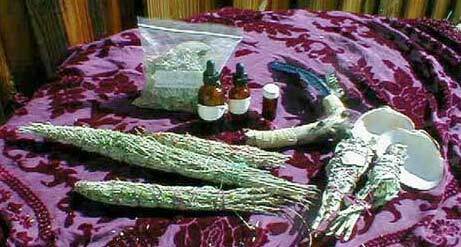 In Western North America the three plants most frequently used in smudging are sage, cedar, and sweetgrass. White Tipped and Feather Sage available.